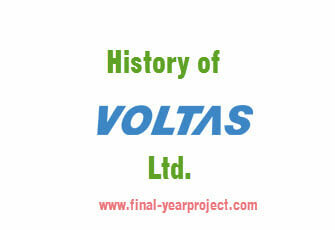 This is a MBA project report on Voltas Ltd. history and will give a brief of History of Voltas Ltd. which is a global air conditioning and engineering services company. As a Tata enterprise, the company offers engineering solutions for a wide spectrum of industries in areas such as heating, ventilation and air conditioning, refrigeration, electro-mechanical projects, textile machinery, machine tools etc. Use this report for your reference only to prepare your MBA synopsis or report. You can also Subscribe to FINAL YEAR PROJECT'S by Email for more such Projects and Seminar. Voltas is one of the world's premier engineering solutions suppliers and project specialists. Founded in India in 1954, Voltas Limited offers engineering solutions for a large spectrum of industries in areas such as heating, ventilation and air conditioning, refrigeration, electro-mechanical projects, textile machinery, mining and construction instruments, materials handling instruments, water management & treatment, cold chain solutions, building management systems, and indoor air quality. The Company's strengths lie mainly in management and execution of electro-mechanical projects, including air conditioning and refrigeration. The design and manufacture of industrial equipment, cooling appliances and materials handling equipment Sourcing, installation and servicing of diverse technology-based systems serving Indian industry through representation of global technology leaders. This reports give complete history of Voltas Ltd. and also give some comparison with other AC making industry.